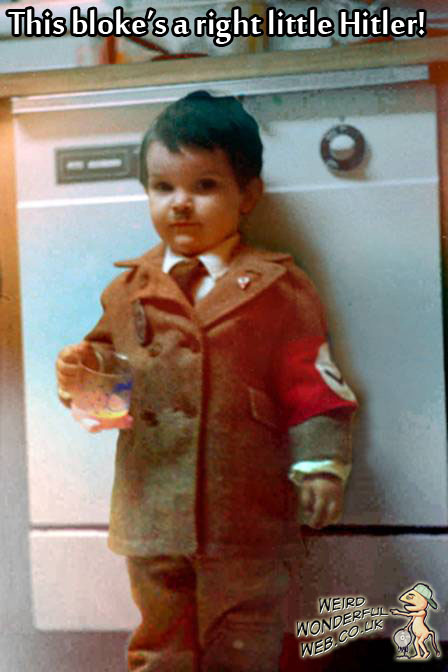 Little boy dressed as Adolf Hitler complete with juice cup. Inspired by Prince Harry, this tyrannical toddler decided to dress like his hero. Seen here in full Adolf Hitler costume fit for a prince. Hitler's alive and touring London! Shark attacked surfer's shark bite tattoo! Plastic surgery to look like Superman! Two similar but very different shark tales!